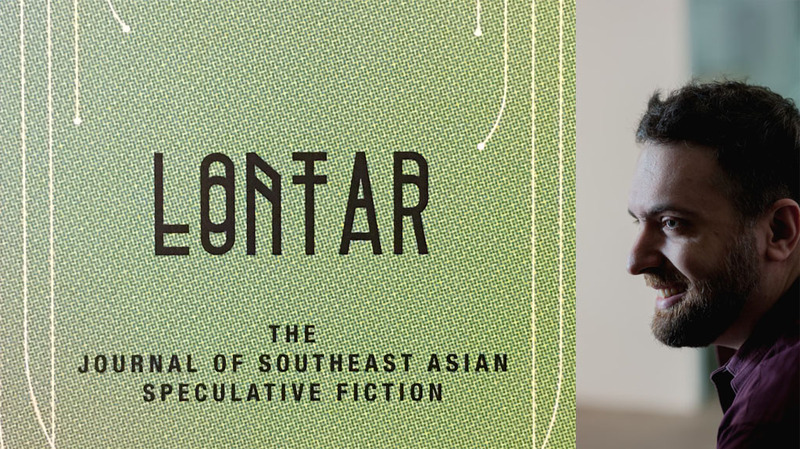 Our editor Ram caught up with Jason Erik Lundberg, editor of LONTAR for a chat, which we published in our first issue here. Some of our readers had more questions for him after reading it. Here we have Jason answering those questions too! What should be the depth of scientific knowledge that a science fiction writer ought to have? I think that all depends on the kind of story you want to tell. There are writers who want complete scientific and technological accuracy in their fiction (this is typically called “hard science fiction”), and others who use science fictional tropes as a vehicle to tell an emotionally true story. Either method has validity, but if you want to write hard science fiction, you should have enough knowledge of what you’re talking about so that you aren’t called out later for inaccuracies or lazy research. How do you keep yourself abreast of scientific developments to help you in your science fiction writing? I’m naturally curious about science, and have been since I was a kid, so I do try to keep up to date with developments that are reported in the news. Which is to say, extremely casually. But that’s okay because I work more with fantastical tropes in my writing than science-fictional ones. Many speculative fiction works in the West are written for commercial entertainment with an eye on Hollywood. Against this backdrop, what do you think is the most common mistake that budding science fiction writers make? The biggest mistake is having Hollywood in your planning at all. Unless you live in California and are a scriptwriter, you should be focusing primarily on telling the best story you can. Very few novels and stories are optioned for film or television adaptation (I don’t have the numbers, but the percentage is tiny), and many works which are optioned don’t make it out of development hell, so you should never ever assume that your writing will be made into a movie; if that happens, it’s icing on the cake, but the cake itself should be the accomplishment of telling the story you wanted to tell, in the best way you could tell it. That said, you must also be very aware of what has already been published. One of my biggest pet peeves is when a debut author crows about how clever their novel is in the way that it uses time travel, Many Worlds theory, faeries, etc., when they’ve actually reinvented the wheel instead. It’s absolutely fine (and encouraged!) to put your own spin on these tropes, but you have to know how they’ve already been explored before you can doing something new with it. It’s easy for budding science fiction writers to fall into the trap of traditional notions. For instance, notions like something that’s man-made can never be better than something from nature. How can a writer avoid this pitfall? By cultivating open-mindedness and curiosity. There is still so much we don’t know about the world around us; how could anyone be so arrogant as to assume they’ve got it all figured out? What do you think is the relationship between speculative fiction and culture (social customs)? Do you agree that science is at odds with traditional culture? How do you blend your ancestral culture with your science fiction? In 2018, speculative fiction is tightly entwined with culture. The biggest movie blockbusters are adaptations of comic books or fantasy series. Our current political climate feels like it was ripped from the cyberpunk novels of the 1980s. The present is speculative. I’m going to skip the second question here, because it is a leading one, and I also already covered it in my previous interview. My ancestral culture is a bit complicated. I’m half Greek on my mother’s side, but I never belonged to the Greek Orthodox Church. I was baptised Episcopalian when I was a child, but was raised as a freethinker. I’ve identified as a Buddhist for the last 13 years or so, but am still highly sceptical about certain aspects, such as reincarnation. Science fiction can examine any or all of these things; nothing is off-limits. What do you see as the key difference between classical and contemporary speculative fiction? Which kind of experimental initiatives in this field excite you? The biggest difference I see is in who is reading it and who is writing it. By “classical”, I’m going to assume this means mid-twentieth century writing, and the vast majority of this was done by white men. Contemporary sf is full of amazing writers who identify as something else, whether by gender, ethnicity, able-bodiedness, sexual preference, etc. We’re seeing so many other stories being made public nowadays, which many white men have seen as a threat to their cultural hegemony; as a white man myself, I see this inclusivity as nothing but a good thing. What’s your take on the popularity of speculative fiction? Do you think this genre overshadows and curbs other genres? It depends on the context. In Singapore, where I’m based, speculative fiction exported from the US and UK seems to be quite popular, but many of these same readers will turn up their noses at sf by Singaporean or other Southeast Asian writers. Speculative fiction is very popular in the US, where I’m from, but only within that community of writers and readers; even when very popular films are adapted from sf source material, it doesn’t translate to more sf readers, sadly. But the whole concept of genre is an arbitrary one, and really only practical for booksellers who want to know where to stock a given title in their shop. Speculative fiction easily combines with action/adventure, romance, drama, comedy, horror, and really anything else you can think of. It’s a mode for telling a story, and is not inherently superior or inferior to any other genre. God is absent in majority of science fiction works. Can we consider science fiction to be a denial of God’s existence? Another leading question, one whose premise I don’t entirely agree with. It depends on which writers you’re reading. But I don’t think we can make such a blanket statement about any genre of writing, because it’s all so incredibly diverse. Which period do you consider as the Golden Age of speculative fiction? Why? Google will tell you that the Golden Age was from the mid-1930s to the mid-1960s, but quantifying this frankly doesn’t interest me. Speculative fiction has had, and will continue to have, myriad golden ages, some of which naturally overlap each other; one of these started in the late-1990s and continues to this day, and is marked by publication and awards going to many of my writer friends. A golden age is a personal thing, delimited only by the availability of writing that truly speaks to you as a reader. இந்தக் நேர்காணலை இங்கே தமிழில் படிக்கலாம்.